I do a lot of vegan cooking at home because I have a cholesterol level that, if you put a decimal point in front of it, would make Ted Williams tip his cap. (Stupid heart. Why can't you just pump blood and foster unrequited crushes?) 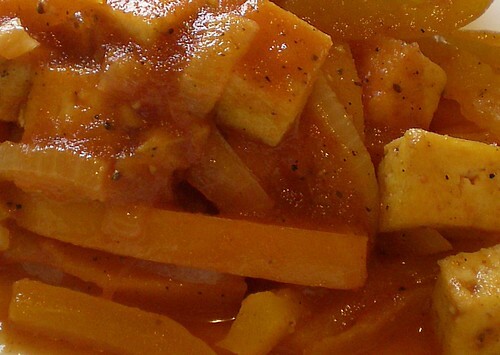 One of the challenges of vegan cooking is making a sauce for a dish that has any significant level of thickness and silkiness without using butter, cheese, or meat-based stocks. Enter corn starch. Corn starch does double-duty here, starting with pan-frying tofu. Unless you use about 1,000 paper towels or a drawer's-worth of tea towels, it's hard to squeeze out enough moisture from tofu that you can actual fry it rather than have it steam in its own liquid. So for the dish in the photo above, I start out by tossing the tofu in a highly seasoned corn starch dredge. The corn starch absorbs the bulk of the liquid, so that when it hits the oil you get browning and crispness. Next you make a slurry by whisking corn starch and cold water together and then stir it into your liquid to thicken. So what is just sautéed peppers, onions, and canned tomatoes transforms into a nice glazed sauce for the tofu. And cornstarch, unlike flour, doesn't make a gloppy paste. So how do you make sauces without meat and dairy? What other uses do you have for corn starch in the kitchen? Jameson Fink is a wine buyer at a bustling grocery store in Seattle’s Capitol Hill neighborhood. He moved to Seattle from Chicago (where he dabbled in the restaurant and wine industries) five years ago to pursue a full-time career in wine. He’d rather be drinking Champagne and eating popcorn right now. Cornstarch yes, and also arrow root, and simply by blending all or part of the sauce/soup. I use cornstarch in some vegan baking as well, as an egg substitute. I am a big arrowroot fan. It doesn't add any extra after taste the way cornstarch does. You start it with a tablespoon in about two tablespoons of cold water and it blends right in. On an un-vegan note, it is the secret to the thick, pudding-like hot chocolate they have in many parts of europe. Corn starch is also the secret to my favorite cooked pudding recipe. Mmmy, chocolate pudding. i don't know what my mom dredges hers in but she makes a great fried tofu!! my dad brought his cholesterol down from 270 to 180 in a few months with just diet changes...it's amazing! I love using cornstarch in my low fat gravy as a thickener of my stews and soups and many other recipes. Yes indeed its a true unsung hero! I've never tried arrowroot but I just might try that too! I dislike using flour since it does not dissolve quite as well. I took my cholesterol from 280 to 128 without changing my diet by adding Red Yeast Rice and Resveratrol supplements to my daily regimen. I doubled up the recommended dosage and within a month brought the numbers down so far that my doctor accused me of sending in someone else for the blood draw :) Interestingly, my cholesterol has remained low, even though I no longer take the supplements. It's been two years now. My triglycerides also went down to 118.